Organized at Harrisburg September 8, 1864. Left State for City Point, Va., September 12. Attached to Provisional Brigade, Army of the James, to October, 1864. Provisional Brigade, 9th Army Corps, Army of the Potomac, to December, 1864. 2nd Brigade, 3rd Division, 9th Army Corps, to May, 1865. SERVICE.--Siege operations against Petersburg and Richmond, Va., September, 1864, to April, 1865. Picketing Bermuda Hundred front from the James to the Appomattox. Joined Army of the Potomac November. Movement in support of Weldon Railroad Expedition December 7-11. Dabney's Mills, Hatcher's Run, February 5-7, 1865. Fort Stedman March 25. Appomattox Campaign March 28-April 9. Assault on and fall of Petersburg April 2. Pursuit of Lee to Burkesville April 3-9. Moved to City Point, thence to Alexandria April 21-28, and duty there until May 31. Grand Review May 23. Mustered out May 31, 1865. Regiment lost during service 3 Officers and 51 Enlisted men killed and mortally wounded and 1 Officer and 24 Enlisted men by disease. Total 79. Companies A, D, H, K, and parts of B, E, and G of this regiment were recruited in Tioga county, C in Clinton, F in Cumberland and Franklin, I in Lycoming, and parts of B, E, and G in Bradford, York, and Lancaster. On the 12th, the regiment started for the front, and upon its arrival at City Point, was ordered to duty with the Army of the James. For four days it remained without shelter, awaiting orders. At the end of that time, it was directed to report to Colonel J. H. Potter's Brigade, and was assigned to picket duty on the Bermuda front, stretching from the Appomattox to the James. The picket lines were here in close proximity, at one point a rebel vidette standing at one end of a prostrate chestnut tree, and the Union at the other. In a ravine between the two lines, ran a cool, clear spring. Around this, soldiers occupying the out-posts of the two armies would, gather, and for the time forgetting that they were enemies, would engage in the friendly conversation of comrades, and exchange papers for coffee and tobacco. On the 16th of November, this friendly spirit was suddenly broken, and at seven in the evening, the enemy charged upon the picket line. The regiment was ordered up to the support of the pickets, and a brisk engagement ensued, in which two were killed and a number wounded. On the 24th of November, the regiment was transferred to the Ninth Corps, in the Army of the Potomac, and with that corps marched upon a demonstration upon the left, but did not become engaged. Upon its return to the Ninth Corps lines, then the extreme right, it went into camp upon the Army Line Railroad, near Fort Prescott, and was incorporated with the Third Division, composed of six Pennsylvania regiments, and commanded by General Hartranft, forming with the Two Hundred and Fifth, and Two Hundred and Eleventh, the Second Brigade. On the 5th of February, 1865, the regiment joined in the movement to Hatcher's Run, the brigade being under the command of Colonel Cox. On reaching the run, it went into line of battle, heavy fighting at the time being in progress away to the left of the position occupied At night orders were given to fortify. Substantial breast-works of logs and earth were thrown up, and the command held in momentary expectation of an attack. But none came, and after remaining in position four days, exposed to inclement weather, it returned to camp. Until the 25th of March, the routine of duty was little disturbed. At a little before daylight on the morning of that day, it was suddenly aroused by heavy firing upon the front. Soon after, orders were received to prepare for action and a rapid movement to the point of attack, Fort Steadman and portions of the line to right and left of it, having been assaulted and carried by the enemy At six o'clock the order to move was received, and marching at double quick, and passing the Avery House, where was General Hartranft's headquarters, and where the pace was slackened to a quick step, proceeded down a ravine, just in rear of the line, until it had come to a point nearly opposite Fort Steadman, when it was halted and took shelter beneath the abrupt bank. The fire of infantry and artillery was incessant, but owing to the protection afforded by the position, little loss was here sustained. When the signal for the general advance by the whole division was given, at a little after eight, the regiment promptly responded; but scarcely had the movement begun, when the Colonel commanding the brigade ordered a halt. Four companies under Colonel Cox, not receiving the order, kept on at a run, and entered the fort with the advanced lines. The remaining companies, after a momentary pause, were again ordered forward, and entered the breast-works and redoubt to the left of Fort Steadman, taking many prisoners and one battle-flag. Emerging, as this regiment did, from cover, where the enemy had no suspicion that troops were concealed, and moving at a run, he had no time to bring his guns to bear upon it before it was upon him. The loss on this account was slight, being but one killed and sixteen wounded. The guns of the fort and batteries were again turned upon the enemy, and the breach was in a short time repaired. The regiment then returned to camp. 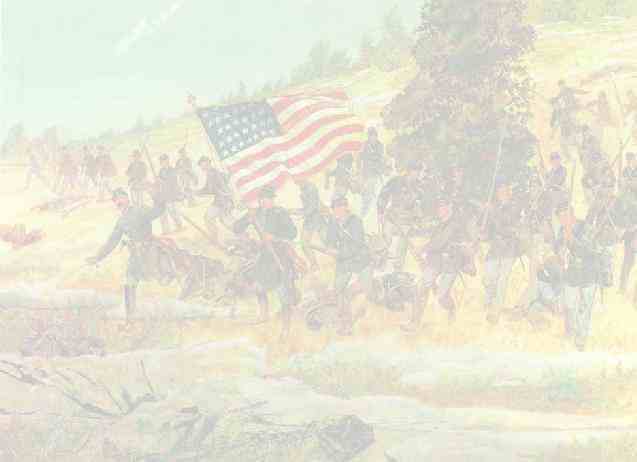 A little after three o'clock, on the morning of April 2d, the Two Hundred and Seventh was led out, and formed in line of battle, directly in front of Fort Sedgwick, the left of the regiment resting on the Jerusalem Plank Road, the other two regiments of the brigade being formed in its rear, and those of the First Brigade, as a reserve, just inside the picket line. Potter's Division was formed to the left of Hartranft's, and a portion of Wilcox's, which had been ordered to report to Hartranft, upon the right, a combined assault having been ordered upon a concerted signal, all along the lines. The enemy's artillery and mortar batteries were already in full play, the sky being ablaze with bursting shells and the fiery trails of the mortar missiles. Just at daybreak, a signal rocket was sent up from the centre of the line, and the order to advance was given. In the face of a murderous fire of grape and canister, and musketry at short range, Colonel Cox led his regiment, closely followed by the rest of the brigade, across the picket line, cleared the picket line of the enemy, paused a moment at the double line of chevaux-de-frise, where strong hands seized the obstructions which the pioneers were busy in breaking, and opening them like gates, rushed through. and with a wild shout carried the enemy's main line, planting the regimental colors uponr the fort which commanded the Jerusalem Plank Road. Turning to the left, the brigade, for now the regiments had become mingled, rushed on and captured three other works with five pieces of artillery. The guns were immediately wheeled upon the enemy, and dispositions made to hold the line. Repeated attempts were made to re-take it, but each assault of the foe was repulsed with great slaughter.
" Officers and men fell on every side. My Color Sergeant, George J. Horning, fell, pierced with seven balls, and three of the color-guard fell wounded by his side. Sergeant C. H. Igenfritz of Company E, sprang forward and raised the colors, and my men rushed over the enemy's worlks, and planted the colors on their fort." "To Colonel R. C. Cox, who commanded the leading regiment, I owe the entire good success that attended the charge. Foremost among those who scaled the enemy's works, cheering his men by his courage, preparing them to meet the many charges of the enemy to re-take the lines, and thus beating them back each time, with heavy losses in killed and wounded, he is deserving of the highest praise." At ten o'clock A. M., Colonel Mathews, who, though suffering from illness, had remained at the fort, directing the movements, was relieved, and Colonel Cox succeeded to the command of the brigade. A very heavy fire was kept up on both sides, the enemy still holding an inner line, and one of his batteries away to the left, which still held out, and which partially enfiladed the position, greatly annoying the command. When the enemy's ammunition, found in the fort, was exhausted, squads from the regiment were sent back to Fort Sedgwick to bring up fresh supplies. The ground which they had to traverse, was commanded by the enemy's guns, and many were killed while crossing it; but enough was brought to keep the guns in play until four P. M., when the firing ceased. The entire loss in the engagement was thirty-seven killed, one hundred and forty wounded, and eight missing, an aggregate of one hundred and eighty-five. Captain James Carothers was among the killed, and Lieutenants Alonzo R. Case and Allen G. Dodd, among the mortally wounded. Ten officers were wounded. At four o'clock on the morning of the 3d, the division was pushed forward into the city, but found it evacuated. After remaining about two hours, the regiment retraced its steps, crossed the lines, where, for upwards of nine months armed men had stood in deadly conflict, now silent and deserted, and returning to camp, made preparations to move in pursuit. The division was charged with keeping open the line of supply which was along the South Side Railroad. At Burkesville, the column halted, and the Two Hundred and Seventh was engaged in picket duty, and in taking charge of, and paroling rebel prisoners. Shortly after the surrender of Lee, it returned to City Point, and thence to Alexandria. It went into camp a short distance from the city, where it remained until the 13th of May, when the recruits were transferred to the Fifty-first Pennsylvania, and the rest of the regiment was mustered out of service.